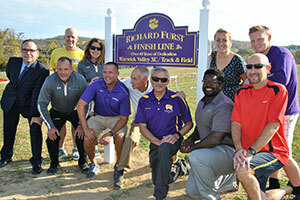 Warwick Athletics and the Warwick School District celebrated Rich Furst’s 40 year career as a teacher and coach on Monday, October 17 at the Warwick Cross Country course finish line. 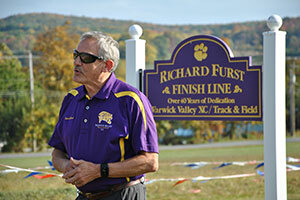 Coach Furst dedicated over 40 years to the Wildcats as a Science Teacher and Cross Country, Indoor and Outdoor Track Coach. 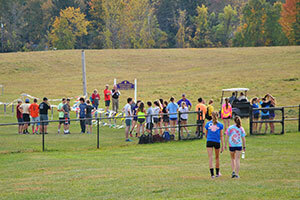 His enthusiasm for students was contagious and appreciated by all he came in contact with. Speakers at the ceremony included Coach Mike Potter; Coach Kirk Thomas; and Stanford graduate, Wildcat All-American and WVHS teacher, Tori Pennings. 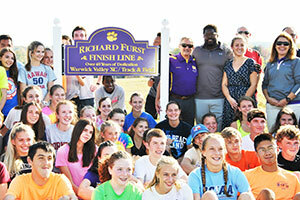 A sign was purchased by the Warwick Track and Field Booster Club in commemoration of Coach Rich Furst’s “Power of Influence” over the many students and athletes he influenced during his tenure at Warwick. 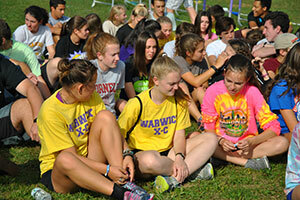 View a photo gallery on the District’s public Facebook page – you don’t need a Facebook account to view this page.